Although the poster caught my eye, I did not know where this gym was located. It seemed like somewhere in the residential area. Besides, when I was going through their programs, all looked stoic and hard. I believe for those of you who have solid goals and can face yourself sternly, private trainers are more than welcome to train you. For me, once I join this type of group lessons, I will be overwhelmed by the seriousness and enthusiasm of my neighbors, and I am pretty sure I will be the first one to drop out. The season that you can show off your skin is just around the corner. We wish to wear something low-cut in the front or in the back, of course. However, the road to go is quite hard. How exciting it is as a play to hide and seek small presents such as colorful eggs or chocolates in the grass of your garden after the snow has melted. How fun and joyous the dinner of spring is when families and relatives gather together. She repeatedly told me about Easter. Pious Catholics abstain from eating meat 40 days before Easter, starting from Ash Wednesday, the first day of Lent. 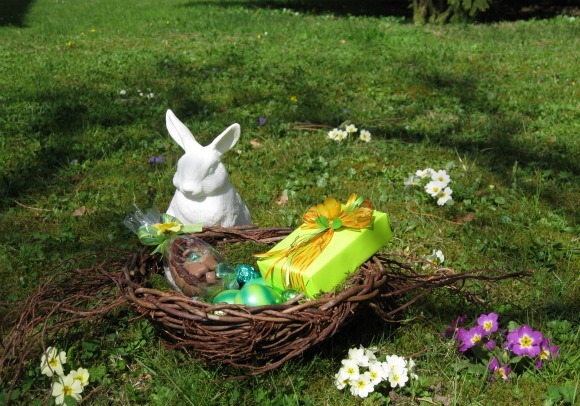 As Zurich is a Protestant town, I have never heard of very strict stories, however, celebratory mood is in the air as Easter gets closer, and people spend time to decorate at home. You will find bunnies everywhere in town. First of all, chocolate shops. Well known Sprüngli established in 1836, or Teuscher which was introduced in Japan, bring out the same old bunnies every year. Looking at some of the new ones, you may see modern artistic bunnies. Those carrying traditional eggs, or playing the accordion, or dancing. It is quite interesting to find such bunnies as if they are jumping out of picture books. Show-windows display bunnies, bunnies and bunnies. In the interior corners of department stores, you will find bunnies of various colors such as green, pink or gold, or bird nests decorated with such eggs, or egg ornaments with beautiful patterns or pictures which can be hung on tree branches. The great granddaddy of them all is the real bunnies. Small rabbits of shiny pink skin with the fur ripped off, lay down in an orderly manner with their limbs stretched out on the trays in the food floor. I sometimes go down their to check if they are still there that day, but I do not have courage to purchse any. Vitality of trees to spout and eggs as a symbol of life. Productiveness and vibrant dynamism of rabbits. Joy and hope. These elements become the symbols to celebrate the rebirth of Jesus and decorate the room. April 2 is Good Friday or Holy Friday. Apart from my faithfulness, I usually cook a whole freshwater fish like seaperch (Suzuki) or trout, to follow the tradition here. This year’s Easter falls under the third day from this day, Sunday, April 4. Traditionally it will be lamb or goat. If you have a big family, I understand you will eat the whole lamb or goat. I wonder this custom teaches the sharing of the sacrificed. I hear rabbit come after lamb in terms of priority. The Easter decoration brought out to the garden. This white bunny was sitting quietly inside the house until a little while ago.